Corona box was empty and in the trash can nearby. I assumed Steve S has picked it up! Wow! Maybe Girraffey is on the lam! The Great Escape! I made a daring rescue of Hobbes (Americana) and Siberian Hobbes at Contes in western Falls Church. We zipped down Rt. 7 (which I thought was 29 for some reason) and realizing my error and upcoming kid sitting and that I was already running a little late, took 50 the rest of the way. At this point Hobbes started punching me through my back pack, but Siber Hobbes thought it was great and she called Hobbes the P word and they were going at it in my back pack. It turned out that Gus got sick and was 冷 so neither of them wanted to visit him anymore, BUT they were really curious as to what the Garden was that popped up in my neighborhood and made me stop to check it out. They were also annoyed that we didn’t get to visit all the young lawyers learning how to be trial attorneys at Kirkland & Ellis last week, so I thought it was only fair. They said it was very jungle-like and laughed at the “bouncer” (I told them to cut it the heck out before they got us in trouble!) who was taking up half of the shop. They made fun of me for not being very cool (apparently they’ve been keeping with some questionable company lately!) and asking twice about the “gifts” . . . I told them my brain was a little fried from Rt. 50 and I got it, I just didn’t want to say the wrong thing. Then they really wanted the free gift that they said they “needed” after Rt. 50. They said they were tired of all the whiskey and beer  they’d been forced to drink lately and wanted to be more “mellow” or something. 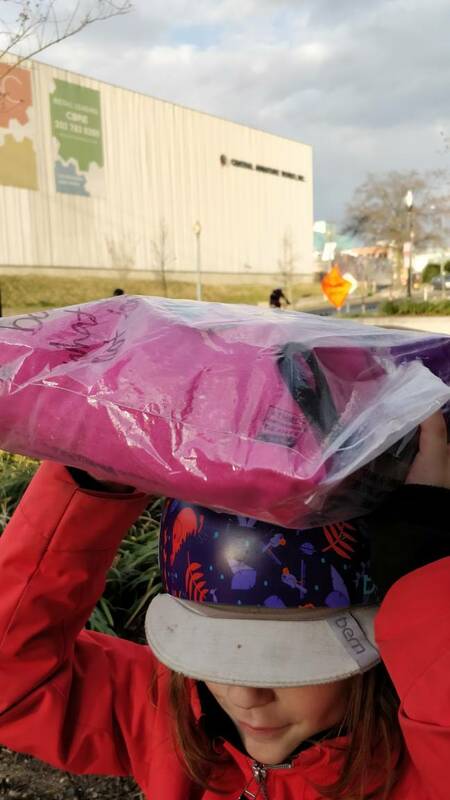 I didn’t give in to their adventurousness this time, but they asked if I’d at least take a picture of them pretending to have enjoyed the “gift”. Such a silly couple of tigers! They also really liked the blue Mercedes. They said, “Isn’t that the one you built a model of as a kid? The SL?” I said it was and we all laughed at how great the bumper sticker was and didn’t Camelot have ? Then we cried a little. Shouldn’t be too hard to find these two. The staff is putting them to work fixing bikes. Last edited by LhasaCM; 03-18-2019 at 05:52 PM. I'm sorry, everyone - we've all been duped, but it's really my fault as I should have "trusted, but verified." Two months ago, I shared how Hobbes built a Transmogrifier to become a Siberian Tiger to cope with the cold weather. I should not have believed him, and I'm sorry for passing along bad information. Thank you to sszibler for hiding them in a convenient location (for us) so that the truth* can finally come out. You see - when he got to our house, I asked Siber Hobbes if he wanted to transmogrify back to his original Hobbes form, now that it's springtime. He said he had no idea what I was talking about, for he's always been a Siberian Tiger. I showed him the Transmogrifier. He suggested I turn it around to look at the other side. Furious at the deception, and mad at myself for not seeing it, I set the tigers to work sorting M's Legos while we think of an appropriate next step. Siber Hobbes went to school with M, while the other two came to work with me. 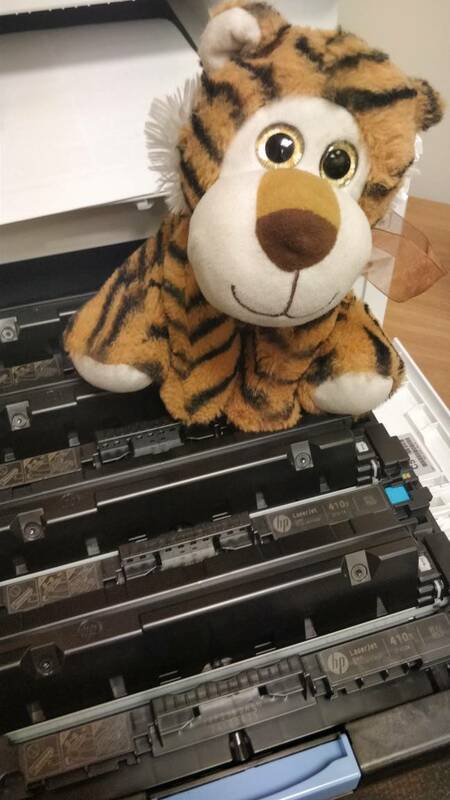 I put Hobbes to work cleaning up and doing a few odd chores like changing toner cartridges. Unlike other "take the tiger to work day" events, I don't really have much more than that to share since, as much as I love my job and have worked here for almost 18 years, it's too exhausting to make it sound exciting. 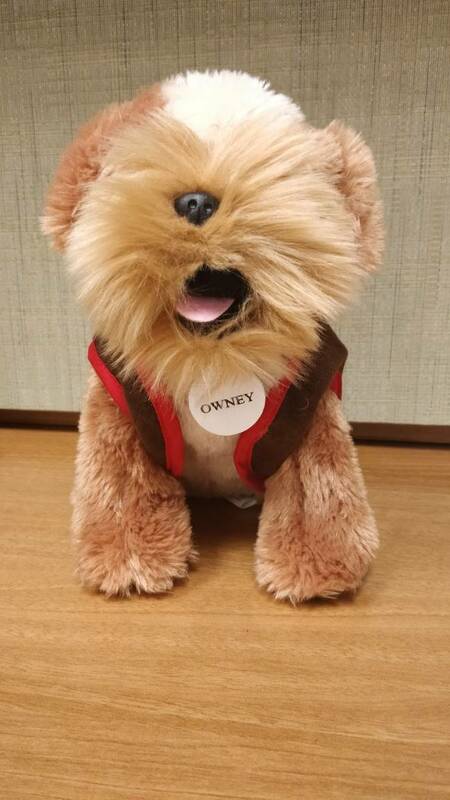 When I came back from a meeting, I thought I overheard the two of them talking about de-duplicating (not sure if it was about themselves or because they overheard me complaining about low storage on the network drive), and something about Owney (whatever that means). Ok - this is getting ridiculous. I came back from another meeting to find this little guy on my desk. Hobbes recruited Owney from downstairs to take his place, since he doesn't want to have to leave our home. But Owney isn't too keen on the idea himself either, so it's getting contentious. There's going to be a LONG discussion tonight before FSLNHPP to figure out who stays and who goes, since they can't all stay. Ultimately, it'll be M's decision (like many other things), but SOMEONE(s?) is (are?) going to be taken to FSLNHPP tonight to be found.